Small animal veterinary blood products have become much more accessible over the past decade. 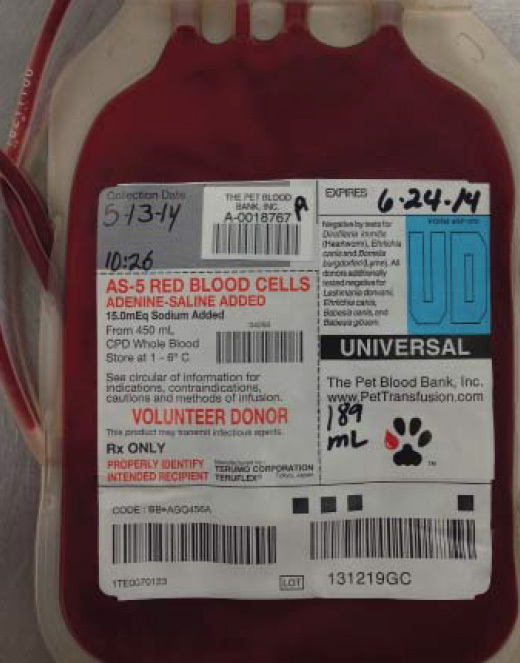 Whole blood, as well as individual blood components, can be purchased from a commercial veterinary blood bank, or can be acquired from a donor animal in a clinical setting. It is important to remember that the administration of biological products carries with it the risk of adverse reactions. Procedures should be reserved for appropriate patients and used in situations where beneﬁts outweigh the risk of negative side effects. Red blood cells (RBCs) can be administered in three main forms: packed red blood cells (pRBCs; Fig. 1), fresh whole blood (FWB) or stored whole blood (SWB). The only indication for transfusion of red blood cell products is anemia, but not all anemic patients should be given red blood cells. Generally, an acutely anemic patient is more likely to need a transfusion than a patient who becomes anemic chronically. Over the years, the search for the elusive “transfusion trigger” (a PCV at which a transfusion is consistently indicated in all cases) has proven to be futile. It has become apparent that there is no particular packed cell volume (PCV) that always necessitates administration of transfused blood. It is best to assess each patient as an individual, giving consideration to the patient’s clinical presentation and the etiology of the anemia. Clinical signs that indicate a patient is dangerously anemic include pale mucous membranes, cold extremities, lethargy, weakness, tachycardia, and tachypnea. Laboratory results that are supportive of profound anemia include a low PCV, increased lactate, low venous oxygen saturation and low base excess. The most common etiologies that result in the need for a transfusion include ongoing blood loss and hemolysis. Blood is classiﬁed into types based on erythrocyte surface antigens that are species speciﬁc. Dogs: There are over 12 known, codominantly inherited, blood group systems in dogs. These are known as “dog erythrocyte antigens,” or DEAs, and are named numerically (DEA 1, 2, 4, etc). The DEA 1 system is divided into subtypes (DEA 1.1, 1.2, 1.3). DEA 1.1 has been found to be the most antigenic canine erythrocyte antigen. Dogs that are negative for the DEA 1.1 antigen are considered to be universal blood donors. Cats: Cats have three main blood types: type A, type B and type AB (very rare). There is no universal donor blood type in cats. Blood-typing and cross-matching are pre-transfusion tests that can assist a clinician in determining the safety of administering blood from a particular donor to a particular recipient. Blood-type testing identifies the blood type of the patient and ensures that blood given to a recipient comes from a donor with a compatible blood type. There are multiple in-house test kits that can be used to determine a patient’s blood type (Fig. 2). Cross-matching is used to determine the compatibility of a blood product with a recipient’s plasma. This test is premised on the fact that the recipient might have developed, or have naturally occurring, alloantibodies against the erythrocyte antigens of a donor’s blood. Dogs are not known to have any naturally occurring alloantibodies. 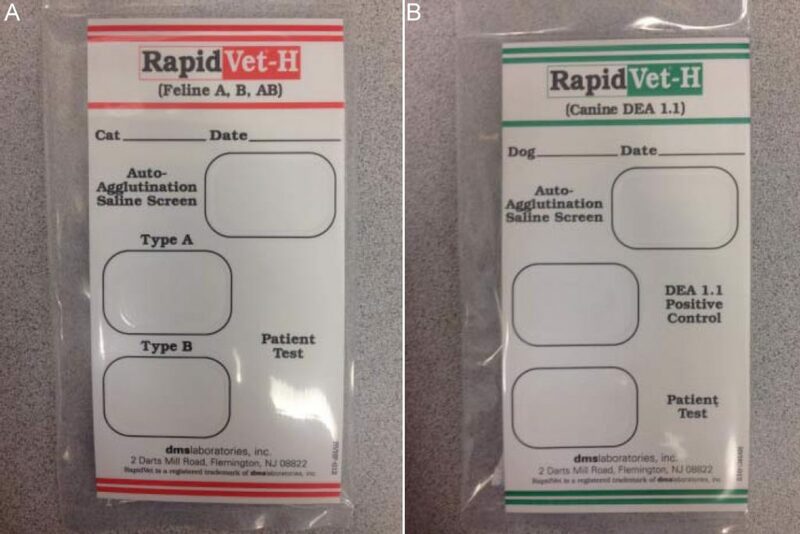 For this reason a reaction is not likely to occur with an initial exposure, and cross-matching is frequently reserved for canine patients who have previously received blood products. Cats, on the other hand, do have naturally occurring alloantibodies. A recent study demonstrated that cats receiving pRBCs shown to be compatible by major cross- match, showed a signiﬁcantly greater increase in PCV than cats receiving type-speciﬁc, non-cross-matched blood. This implies that incompatibilities due to alloantibodies to erythrocyte antigens other than those of the AB blood-type system were identiﬁed by cross-matching and this practice contributed to the increased efﬁcacy of the transfusions in these patients. These ﬁndings suggest that cross-matching should always be performed with feline red blood cell transfusions. 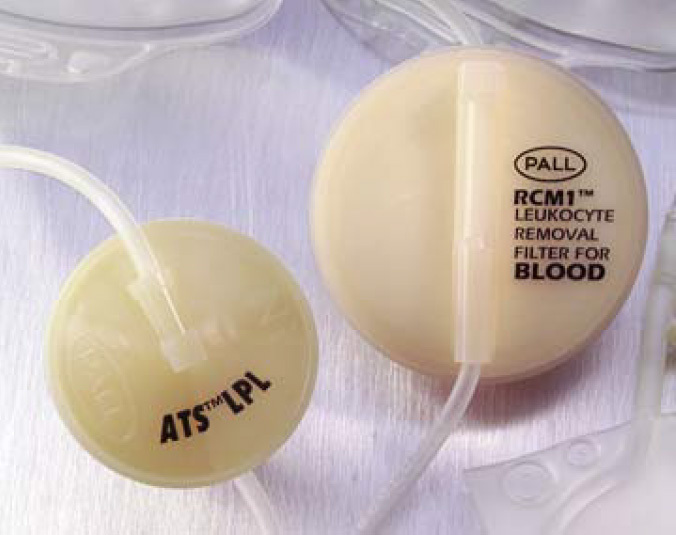 Blood products should be administered through a dedicated intravenous catheter. It is important that ﬂuid products and medications are not given through the same line as this can lead to derangements in coagulation. A blood transfusion is generally timed to occur over the course of four hours in order to minimize the chances of bacterial contamination of blood product and potential damage to erythrocytes themselves. It is important to consider the cardiovascular status of the patient when assigning the rate at which a transfusion is administered. In patients with heart disease for instance, it may be necessary to administer pRBCs at a slower rate to avoid circulatory overload. Blood products can be administered via a number of techniques. It is possible to use either gravity ﬂow or an infusion pump to deliver transfusions. Gravity ﬂow administration allows blood to drip from a blood bag through an administration set with a built-in ﬁlter into the patient. There are two main types of infusion pumps used to administer blood products. These include volumetric peristaltic ﬂuid pumps and syringe pumps, both of which administer blood through an infusion line with an attached microﬁlter. A 2011 study found that use of the gravity ﬂow method resulted in a greater number of surviving red blood cells in the short-term in canine transfusion recipients as compared to the use of either pump method. In contrast, feline red blood cells do not appear to suffer from decreased short-term survival when administered by syringe or volumetric pump. 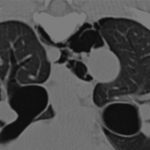 This difference may be related to the smaller size of feline erythrocytes or the erythrocytes may be better able to handle the mechanical stress that occurs during transfusion. 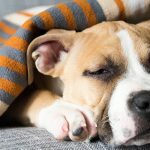 The incidence of transfusion reactions in dogs has been reported to be anywhere between 3 and 18%. Transfusion reactions are categorized as either immunologic or non-immunologic. Immunologic transfusion reactions include immunosuppression, hemolysis, urticaria, anaphylaxis, transfusion-associated lung injury (TRALI), and most commonly, febrile non-hemolytic reactions (FNHR). Febrile non-hemolytic reactions are suspected to be the result of the presence of white blood cell-produced cytokines in the blood product administered. 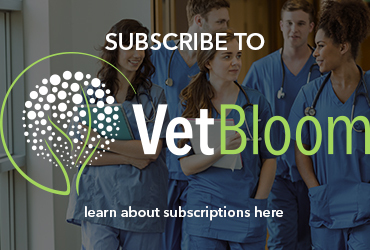 Studies in both human and veterinary medicine have demonstrated a dramatic decline in the incidence of FNHR when transfusion recipients are given blood products that were leukoreduced. Leukoreduction is the process of ﬁltering blood (Fig. 3) at the time of collection to remove white blood cells. It has been shown that this process decreases the number of cytokines that accumulate in blood products during storage. Non-immunologic transfusion reactions frequently occur because of inappropriate handling or administration of blood products. In order to ensure that all transfusion reactions are identiﬁed, it is very important to closely monitor patients throughout the entire duration of a transfusion. Record the following every 15 minutes for the ﬁrst hour of the transfusion and then every hour until the transfusion is complete. If a transfusion reaction is identiﬁed in a patient, stop administration of the blood product before administration of medications. Medications used to treat transfusion reactions include antihistamines and glucocorticoids, in cases of anaphylaxis. Epinephrine and shock doses of crystalloids may be indicated. After the patient has been treated, it is usually possible to restart the transfusion, though it is frequently recommended to do so at a slower rate. The question of whether premedication with antihistamines and steroids before administration of blood products is beneﬁcial was examined in a recent study. The authors found that premedication did not signiﬁcantly decrease the chances of a transfusion reaction occurring, although administration of diphenhydramine did decrease the number of acute allergic reactions. There exist a number of formulas to help determine what post-transfusion PCV should raise to after a blood transfusion. A recent study found that the formula below was the most accurate of these at predicting the post-transfusion rise in PCV. However, due to the fact that ongoing pathology and hemolytic reactions can work against a transfusion by removing otherwise healthy transfused erythrocytes from circulation, frequent re-evaluation of the clinical status of the recipient is probably the best measure of the success of a transfusion. If an anemic patient’s heart rate, respiratory rate, mentation and strength return after receiving blood products, the transfusion has been efﬁcacious even if the PCV didn’t rise as high as a formula might have predicted it should have. Ideally, blood products should be stored in a designated, dedicated refrigerator that contains no other items. The refrigerator should be opened as infrequently as possible to avoid ﬂuctuations in temperature and should only be opened to retrieve products needed for administration to a patient or to stock it. The temperature of the refrigerator should be closely monitored and maintained between 34-42˚F (1-6˚C). Blood bags should be stored upright with space between each individual unit. Gently agitate units of blood every other day so as to re-combine the red blood cells with the anticoagulants and nutrients in the bags. Maintain a log of each unit with its expiration date. Never administer expired products to a patient. It is important to remember that blood transfusions are not benign. Strict adherence to proper blood storage practices, sensible determination of which patients are good candidates for a red blood cell transfusion, and close monitoring of patients receiving blood products are all important aspects of ensuring successful outcomes from treatment of anemic patients, with a minimum of adverse effects. Bruce JA, Kriese-Anderson L, Bruce AM, et al. Effect of premedication and other factors on the occurrence of acute transfusion reactions in dogs. J Vet Emerg Crit Care 2015; 25:620-30. Corsi R, McMichael M, Smith SA, et al. Cytokine concentration in stored canine erythrocyte concentrates. J Vet Emerg Crit Care 2014;24:259-63. Giger U. Transfusion Therapy. In: Silverstein DC, Hopper K, editors. Small animal critical care medicine. St. Louis: Elsevier; 2015. p. 327-32. Hann L, Brown DC, King LG, et al. Effect of duration of packed red blood cell storage on morbidity and mortality in dogs after transfusion: 3,095 cases (2001-2010). J Vet Intern Med 2014; 28:1830-7. Heikes B, Ruaux C. Effect of syringe and aggregate filter administration on survival of transfused autologous fresh feline red blood cells. J Vet Emerg Crit Care 2014; 24:162-7. Holowaychuk MK, Leader JL, Monteith G. Risk factors for transfusion-associated complications and nonsurvival in dogs receiving packed red blood cell transfusions: 211 cases (2008-2011). J Am Vet Med Assoc 2014;244:431-7. Prittie JE. Controversies related to red blood cell transfusion in critically ill patients. J Vet Emerg Crit Care 2010;20:167-76. McDevitt RI, Ruaux CG, Baltzer WI. Influence of transfusion technique on survival of autologous red blood cells in the dog. J Vet Emerg Crit Care 2011;21:209-16. McMichael M. Prevention and treatment of transfusion reactions. In: Silverstein DC, Hopper K, editors. Small animal critical care medicine. St. Louis: Elsevier; 2015. p. 333-7. McMichael MA, Smith SA, Galligan A, et al. Effect of leukoreduction on transfusion-induced inflammation in dogs. J Vet Intern Med 2010;24:1131-7. Patterson J, Rousseau A, Kessler RJ, et al. In vitro lysis and acute transfusion reactions with hemolysis caused by inappropriate storage of canine red blood cell products. J Vet Intern Med 2011; 25:927-33. Short JL, Diehl S, Seshadri R, et al. Accuracy of formulas used to predict post-transfusion packed cell volume rise in anemic dogs. J Vet Emerg Crit Care 2012; 22:428-34. Stillion JR, Fletcher DJ. Admission base excess as a predictor of transfusion requirement and mortality in dogs with blunt trauma: 52 cases (2007-2009). J Vet Emerg Crit Care 2012: 22:588-94. Weltman JG, Fletcher DJ, Rogers C. Influence of cross-match on posttransfusion packed cell volume in feline packed red blood cell transfusion. J Vet Emerg Crit Care 2014; 24:429-36.